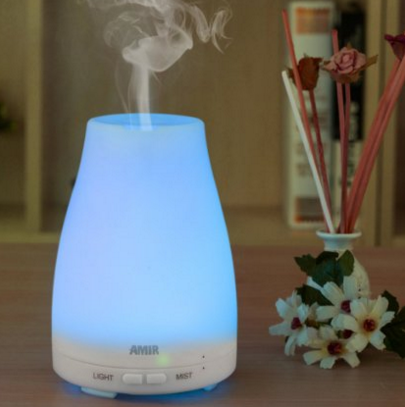 Amir® Ultrasonic Aromatherapy Oil Diffuser Cool Mist Aroma Humidifier Just $26.99! Down From $49.99! You are here: Home / Great Deals / Amazon Deals / Amir® Ultrasonic Aromatherapy Oil Diffuser Cool Mist Aroma Humidifier Just $26.99! Down From $49.99! Check out this great Amazon deal! Amir® Ultrasonic Aromatherapy Oil Diffuser Cool Mist Aroma Humidifier is just $26.99 down from $49.99! Get yours now before this great price is gone! RELAX – Fill the space it was with a lovely fragrance that can lift your mood and relieve stress from stressful and tired day, perfect for masking stubborn smoking and pet odors, get great and peaceful nights’ sleep surrounded by the aromatic fragrance.